Here's another data graph for you, covering the period from the winter solstice to the end of March. 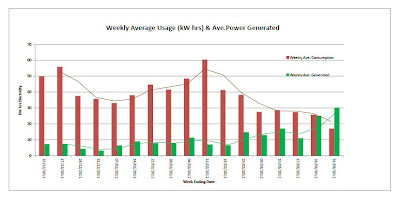 The green bars correspond to the amount of energy being generated by the PV and thus the amount of sunshine. The purple bars show the external temperature and the brown the hours the heating has been boosted inside when the temperature has dropped. These are plotted against the lines for the house temperature on the top (red), first (yellow) and ground (blue) floors. I should point out now that this is a domestic record of what's happening in the house: the energy records are accurate but they aren't always taken at the same point each day and the temperature readings come from a normal thermometer rather than a more scientific instrument. Nonetheless this records what's been happening in this particular Passivhaus over the past three months. The graphs suggest the first floor is the most responsive to sunshine and it certainly receives more than the floor below where the wall and house of a neighbouring property shadow the windows for more of the day. On the other hand, it's also the floor containing the kitchen so the extra warmth from cooking may be what's keeping it warmer than the ground floor. 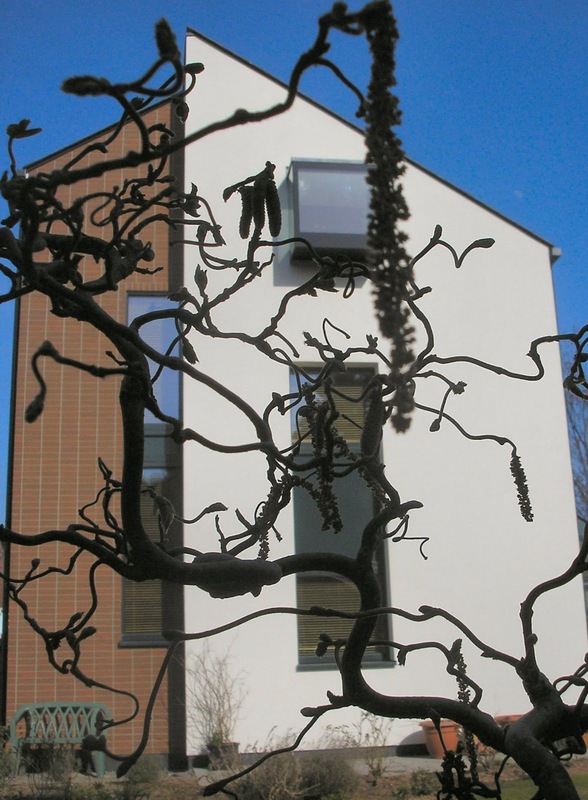 The top floor is the most responsive to the internal temperature of the house and less affected by sunshine. The temperature on this floor climbed at the end of March as the lower floors became warmer and the warm air rose but we got into the habit of opening the rooflights to cool the rooms and kept the blinds closed to exclude direct sunlight during the day. The question, of course, is will this be enough to keep the house comfortable in the event of a heatwave in the summer? Well this has been the fortnight the house woke up from hibernation and it wasn't a gradual sleepy start either but a very definite throwing off the covers and flinging back the curtains approach to spring. Two weeks ago, in my previous post, I was writing about how cool (in the temperature sense) the house was and how we were waiting for it to come up to temperature; then the weather changed. For all but one of the last fourteen days the solar panels have been generating more power than we've used and the average temperature inside the house has gone from 18 to 22-24 degrees (for the less scientific amongst you that's the difference between wearing a fleece in the evenings and grumbling to wearing a T-shirt). 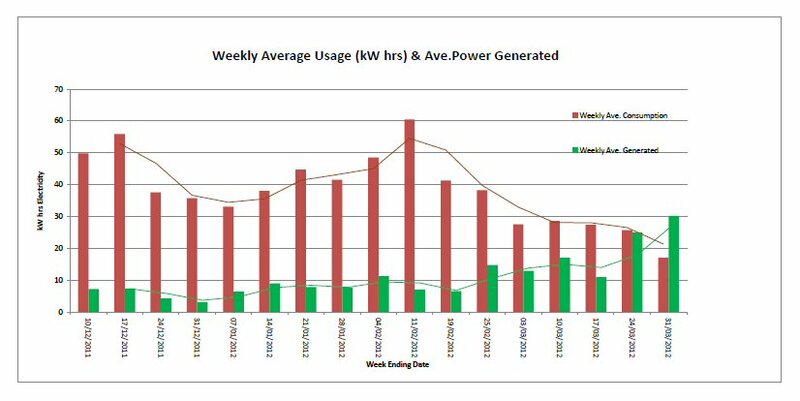 The chart here is our record of how much energy we've been using each week (the brown bars) and how much energy the PV has been generating (green). You can easily spot the time round the winter solstice because the PV produced the least energy then. The combination of short days and the sun being at its lowest height in the sky meant that the panels didn't receive enough direct sunlight to work much. You can also see the icy weather in early December and the cold and snow in February because the energy consumption goes up as we run the heating more. The fluctuations in the brown consumption bars are caused by the amount of sunshine and illustrate clearly what I've said before about the sunshine warming the rooms and reducing our need for backup heating. Then, of course, there is the green trendline that shows how as the days get longer and sunnier our energy production increases. The sunshine has also made a difference to how we've been working with the house. As the days got warmer at the beginning of the month we were opening the porch door and blinds to let the sunlight into the house. In the past week, when the external temperatures here were around 20 degrees, we started closing or tilting the blinds to reflect the light away from the rooms as it was getting too hot inside. We're also now opening some of the roof windows at night to cool the top floor as 24 degrees is too warm to get to sleep. If we didn't have blinds on the south-facing windows the house would be getting too hot already and as it's working rather like a greenhouse we're improving our environment even further by getting more houseplants. We still don't know what will happen to the consumption-production balance on grey days as the days get longer but, so far, the data from the eco frontier suggests that solar energy is beginning to look like a no-brainer even here in the grey West Midlands. This begs the question of why the UK government isn't doing more to encourage its adoption, though after the recent newspaper reports one wonders if perhaps the solar industry simply lacks the lobbying power of its energy competitors; a depressing thought.